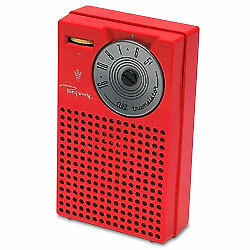 It was not that many years ago that most people carried a transistor radio with them. They took it to the beach or to a party and radio was the primary source of musical entertainment. Today there are still lots of radios in cars, in homes and in the work place. But the one place that radio is not, is the one device that most people look at and use multiple times a day. That of course is the smartphone. To be fair, there are some Blackberry and HTC devices that have a radio tuner built in and activated, but the most popular phones cannot listen to a local radio via a tuner built into the smartphone, because either the manufacturer or the carrier has not activated the FM chip which allows this to happen. Did you know that many of today’s smartphones already have an FM receiver built in, but not activated? This means that everyone could have easy access to radio for the entertainment they love and information they need, but those FM receivers are not activated by all wireless carriers and phone manufacturers. Listening to FM radio provides as much as a six-fold battery life extension over online streaming services. Also they noted that battery life is better when listening to radio on a built in tuner on your smartphone as opposed to streaming audio. 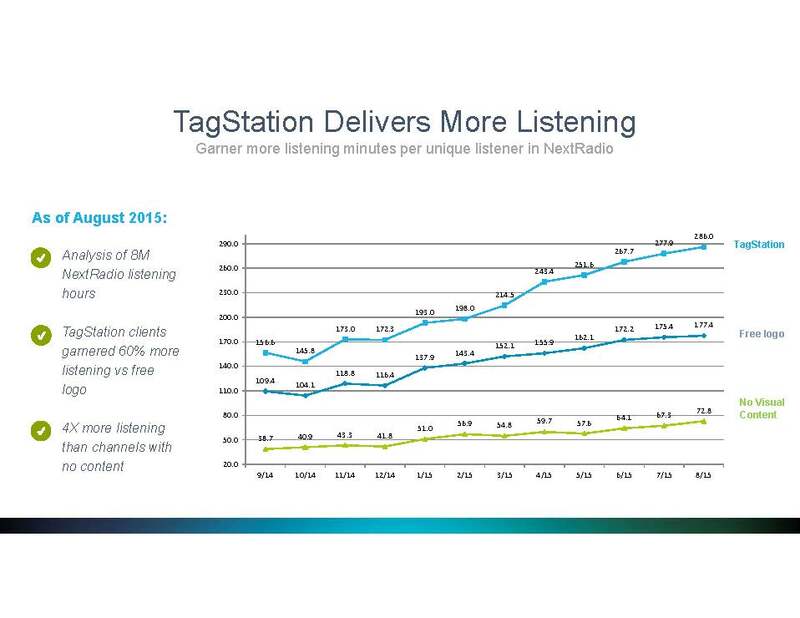 According to the NAB, FM radio listening on a smartphone has almost no impact on a user’s data plan. However, according to the NAB, labs streaming 2 hours of an online radio services per day can consume over 3.5 gigabytes of data per month. When the FM chips is enabled, every smartphone can be a radio, allowing critical emergency information to be distributed by radio stations quickly and efficiently. There is absolutely no cost to the carrier, but there are revenue share opportunities which could be a welcomed source of revenue for both radio and the cell phone companies. 68% of all smartphones the FM chip is unavailable or could not be identified. Of these phones, Apple iPhone made up 67%. Getting the FM chip activated in Canada is starting to gain some traction. But this may not be easy because some of the cell phone companies don’t see the value in allowing this to happen. There are training and support challenges and costs associated with this. But the main reason that some cell phone companies don’t want to see this happen is because they are eager for consumers to use lots of data because that is where they make the big money. Also, some of the companies who manufacture these phones have their own strategy and hope to benefit in some way from not allowing the FM chip to be activated. For example, Apple launched iRadio a year ago. It has been total disaster for Apple and in early 2016 they quietly shut that division down, and today the only Apple Radio stream I can find is Beats1. But getting the FM chip activated is only half the battle. Next we need a single app that can tune all radio stations that can be heard in an area and make it really easy for listeners to find the station they wish to listen to on their smartphone. 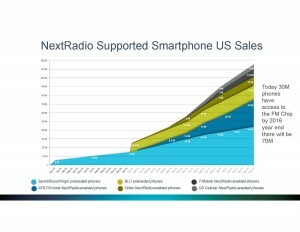 Fortunately, all the heavy lifting has already been done thanks to a number of American broadcasters who developed the NextRadio app. This is a simple app that can come pre-installed on your smartphone. 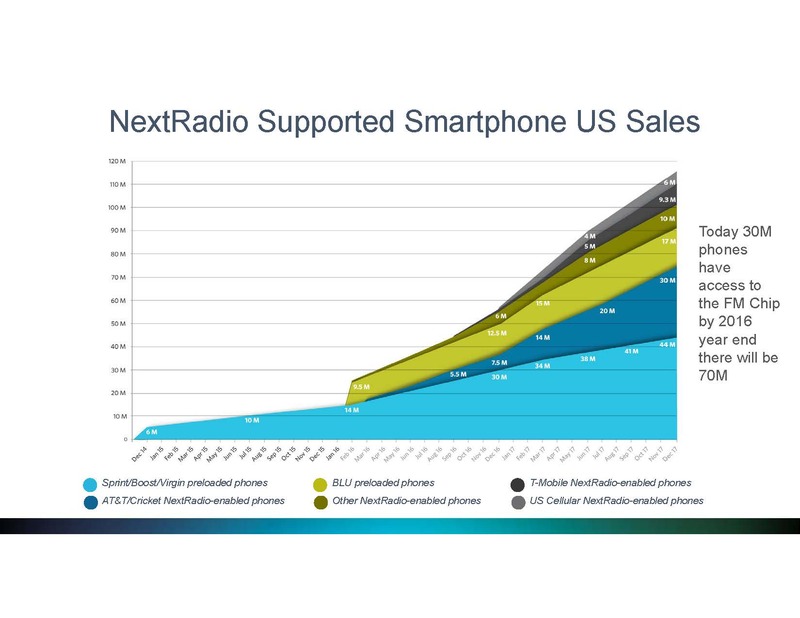 In the USA, Sprint entered into an agreement with Next Radio and has shipped over 8 million phones with the FM chip activated and the NextRadio app already installed out of the box. 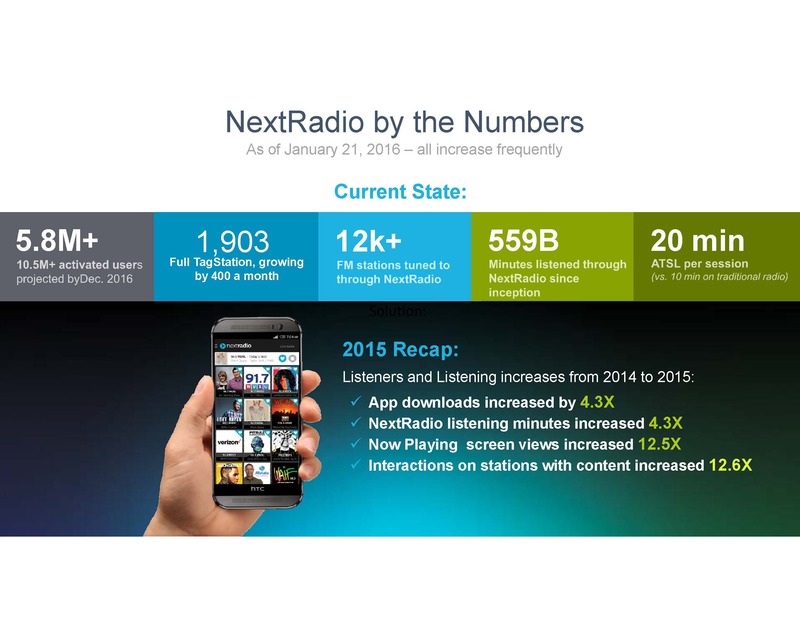 In addition, the Next Radio app has been downloaded over 5.7 million times onto other phones as at the end of 2015. There are over 12,700 radio stations available on the app which covers almost every radio station in the USA. This all happened because radio in the USA took a very proactive approach and ran promos and PSA’s educating the public about the benefits of activating the FM chip. They used the power of radio to drive listeners to websites such as www.freeradioonmyphone.org and encouraged consumers to contact their cell phone provider, the FCC congress and even Apple and demand that they activate the FM chip. They also encouraged listeners to use the power of social media to spread the word using the hashtag #UnlockFM. As at the time of writing this article there is now only one of the major US wireless carriers who have yet to activate the FM chip in smartphones and that is Verizon. However it is important to note that Apple, who have a massive share of the market Apple have not as yet activated the FM chip in the USA, even though it is built into every one of their phones. Built into the NextRadio app is the Tag station tools which allow listeners to not only hear the radio station, but also display album artwork and provides listener interaction. 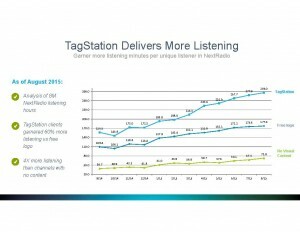 Tag stations also synchronizes visuals and provides value metadata to improve the listener experience. Listens can purchase songs instantly, or click on an ad graphic for a voucher, or directions to the location. 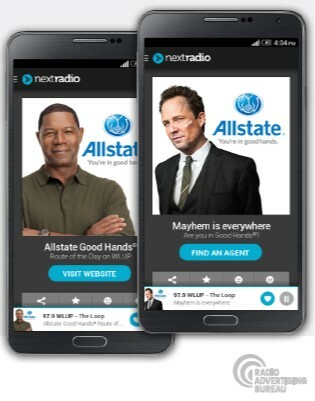 NextRadio ran a national test case with Insurance giant Allstate on 245 radio stations in 78 markets from April until mid September 2015. When the ad played on radio it was synchronized with the image, and digital call to action in the NextRadio App. 2.28% of listeners responded directly to the Allstate campaign which is 114 times better than the advert click through ratio on a display ad on a website. I am told that the NextRadio people had a high level meeting with at least one Canadian cell phone carrier at the Consumer Electronics Show in Vegas recently and there appears to be a level of interest. However, they will likely want to know that most Canadian radio stations are prepared to embrace NextRadio before they ink a deal. 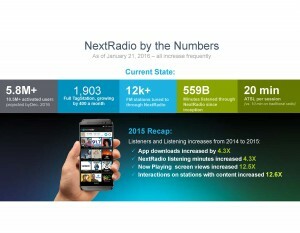 By the way, NextRadio was one of the hot items shown off at CES in Las Vegas in early January. It was shown on the latest smartphones such as BLU who released their new Vivo 5 and Vivo XL, both in shiny gold and featuring NextRadio as the native FM tuner application. NextRadio has partnered with BLU to be the native tuner for all forthcoming devices. Also, the NextRadio app was being demonstrated in the Ford booth as a featured SmartDeviceLink app. SmartDeviceLink is Ford’s open-source platform for connecting smartphone apps with the Sync car dashboard, and the technology was also recently adopted by Toyota. The in-vehicle demo showed how the FM tuner worked as powered by NextRadio. The app connects via Bluetooth and uses the station guide and metadata from NextRadio to create a visual and interactive radio experience in the car dashboard. This is perhaps the most compelling reason for our industry to band together and not only get the FM chip enabled but also to ensure the app is on as many car dashboards as possible. I have been shopping for a new car for some time and have sat in lots of 2016 models and already I am seeing vehicles in Canadian show rooms with Apple’s Carplay and Googles Android Auto product. We need the radio to be in the car dashboard, and extend that to include the Nextradio app so listeners can enjoy the full extent of the tools and benefits this app offers. “I don’t think people realize how vulnerable they are. For example, recently there was an earthquake in Virginia and while there was no real damage to the cell system, there was such high data demand, and demand for getting through, the system crashed and people could not make, and in many cases receive, calls. So, all of a sudden, their smartphone became a brick. We also saw the same thing happen when Hurricane Sandy hit the Eastern seaboard. The cell systems went down or data was overloaded, and people could not get information. But when you start combining functions, like putting FM chips into cell phones, you start getting local radio. So even if the cell systems are overloaded, you still get that information and it moves us beyond streaming. With radio chips in smartphones this is way to ensure that when all else fails, you can still get from the broadcasters critical information, because the government’s going to turn to the broadcasters and we’re going to pump information either through the emergency alert system or through broadcasters. We always say all disasters are local and the most important information is going to come from those local broadcasters that are plugged into local officials, telling you what’s going on, on the ground. In a crisis, your best source of information is going to be the locals, and a lot of times, that’s going to be on radio. At FEMA we still recommend every person have a portable radio with some sort of emergency power, whether it’s batteries, solar or hand cranked. In Canada there are lots of reasons to push to get the FM chip enabled, and also adopt the NextRadio model. Frankly, it seems like a no brainer from a public safety point of view, but it will require action on the part of our industry to make this happen. Jan 29-Feb 15 “Winterlude”: Ottawa, ON. Annual celebration of Canadian winter. Call 613-239-5000 or 800-465-1867. Web www.capcan.ca/winterlude. Feb 1-5 “International Networking Week”: To celebrate the key role that networking plays in the development and success of businesses around the world. Call Ivan Misner, PhD 1-800-825-8286 or email internationalnetworkingweek@bni.com. Feb 5 “Working Naked Day”: A day for all those who are working from home “naked” – stripped of the resources that millions take for granted in the traditional corporate workplace. Feb 5-14 “Ontario Winter Carnival Bon Soo”: Sault Ste. Marie, ON. One of Canada’s largest winter carnivals. Call Donna Gregg 866-899-1607, email mrbonsoo@bonsoo.on.ca or see www.bonsoo.on.ca. Feb 6 “Safer Internet Day”: To promote safer and more responsible use of online technology and mobile phones, especially among children. See www.saferinternet.org. Feb 7 “Super Bowl 50I”: Levi’s Stadium, Santa Clara, CA. Call 212-450-2000. Web: www.nfl.com. Feb 9 “New Mexico: Extraterrestrial Culture Day”: A day to celebrate and honour all past, present and future extraterrestrial visitors in ways to enhance relationships among all citizens of the cosmos, known and unknown. Annually the second Thursday of February in New Mexico. Feb 15 “Family Day (AB, BC, MB, ON, SK)”: Annually, the 3rd Monday in February. Feb 15-22 “National Scout-Guide Week”: see www.scouts.ca or www.girlguides.ca. Feb 21-27 Freedom To Read Week: An annual event that encourages Canadians to think about and reaffirm their commitment to intellectual freedom. www.freedomtoread.ca. Feb 24 “Pink Shirt Day”: A day of anti-bullying. See www.pinkshirtday.ca. Feb 27 “World Thinking Day/Founders Day”: Birth date of both Lord and Lady Baden-Powell, founders of Boy Scouts and Girl Guides. Don’t be surprised to see members of these organizations in uniform today at school and work. See www.scouts.ca or www.girlguides.ca. Feb 27 “Open That Bottle Night”: A night to finally drink that bottle of wine that you’ve been saving for a special occasion that never seems to come. Email Dorothy J. Gaiter and John Brecher of the Wall Street Journal at wine@wsj.com. There are lots of interesting new gadgets on display for all to see at the Consumer Electronics show in Las Vegas. Automotive technology takes center stage at the massive tech show with more space than ever dedicated to automotive and the various companies offering add on’s to improve safety and the driver experience. One company that showed up last year was Aupeo who promised to simplify the global complexity of in vehicle connected audio content delivery, and offer unique and high quality listening experiences for drivers all while giving auto makers a new way to communicate with their customers in and out of the vehicle. This company was acquired by Panasonic in 2015 and re-branded as OneConnect. David Taylor, CEO and managing director of Aupeo OneConnect, says the platform could be used by advertisers to communicate directly with consumers in the car. “The vehicle remains the No. 1 listening location for most consumers, and now brands can send targeted information directly to an engaged audience,” he said in a release. “This is one more step in adding a personalized level of service and usefulness to the in- vehicle customer experience.” The Platform is a versatile state-of-the art cloud based brand marketing and content delivery platform. It allows to create individual services and user experiences around connected audio use cases. It can be used beyond the vehicle to entertain and inform your customers while providing you with invaluable new Customer Relation Management opportunities. Meanwhile, Ford announced two deals at CES this week. One with Amazon and a second with the ride sharing service called Lyft. Ford has invested $500 million in this service service which boasts cutting-edge app technology, and promises that wherever you’re headed, count on Lyft for rides in minutes. The Lyft app matches you with local drivers at the tap of a button. Just request and go. Automobile manufacturers and technology companies are investing heavily in self-driving vehicles, and consumer interest is clearly increasing. Car owners want more integrated technology and in-car capabilities, including Wifi and products like Google’s Android Auto and Apple’s CarPlay which allow drivers to access smartphone apps, including music, via the digital dashboard touch screen, buttons on the steering wheel and even voice commands. GM is positioning itself for a future when fewer people will actually own cars, and instead, opting for ride-sharing and on-demand services. As part of its deal, GM and Lyft are creating a fleet of rental vehicles for Lyft drivers, and also developing an on-demand network of self-driving cars. “GM wants to be in the pole position of manufacturing those cars, particularly if that rise in demand for ride services comes at the expense of individuals owning their own cars,” Jason Harrison, global CEO of Gain Theory, told Adweek. Any advances in digital dashboards and smartphone integration create fresh opportunities for radio broadcasters to deliver on-demand content to drivers, and radio owners need to be improving their digital offerings if they want to retain control of in car listening. Autonomous cars are one of the hot areas at this week’s 2016 Consumer Electronics Show in Las Vegas, with carmakers and technology companies showing off new features that allow drivers to be passengers in their own vehicles and transform commuting into time for entertainment and work. “Cars are essentially becoming the next must-have mobile device,” Jason Harrison, global CEO of Gain Theory, told Adweek. That creates huge opportunities for content providers and advertisers. At CES, car companies including Volvo, Hyundai and Audi, among others, are previewing their latest self-driving and advanced car technologies. With self-driving cars expected to hit the market in 2020, according to analysts’ predictions in Adweek, the pressure is on radio broadcasters to deliver content that keeps its audience engaged and entertained. Once a driver is freed up and the car pilots itself, a consumer can still listen to radio, but can also watch videos, use social media, browse the web and video chat. One of the services competing for in car ears, especially in the USA, is Pandora who rolled out details on an educational effort to help auto sales personnel spotlight Pandora as a central entertainment option in enabled vehicles. The opportunity for radio is to offer additional content, exclusive features like podcasts, original video and concert series that could be transformed into in-car entertainment, if a driver is free to use their ears and eyes. The world’s biggest Consumer Electronics Show, or CES for short is underway in Las Vegas for 2016. This year there at least 115 automotive companies who will be showing off the latest gadgets designed to make the driving experience better in the future in the Vehicle Intelligence Marketplace in the North Plaza. Something that caught my eye was the new Apline 9 inch unit which incorporates Apple’s CarPlay. Also, Ford CEO Mark Fields announced that they’re going to “change pretty dramatically” and become an “auto and mobility” company. PCMag talked to Mark about this new direction for the company. While we don’t actually see any of the things that Ford are showing off at CES in this video, Field mentions a number of interesting things that Ford are planning, and references the connected car and how they are improving the entertainment center. He also talks about Drones that can take off and land in the back of your F150! We will bring you more information about the connect car as it becomes available. At long last we also get to see the updated version of the VW bug as Volkswagen take the wraps off the Budd-e, a little electric van that evokes Microbuses of yesteryear. You could see this on the road by 2019. Volkswagen’s new MEB platform will enable a series production car to have pure electric range that is on par with today’s gasoline-powered cars by the end of the decade. The time required to charge the batteries to 80 percent of capacity is anticipated to be reduced to about 15 minutes by then, marking an operational breakthrough for EVs. The Chevy Bolt is also a game-changer, and may give Tesla some competition. It will be capable of traveling more than 200 miles on a single charge and it will cost around $(US) 30,000 after a $(US) 7,500 tax deduction. No word on Canadian pricing at this point.